Nicholson's pub near Victoria Station. It's a reasonable size inside, but broken up with partition walls and wood-and-glass room dividers, so it feels more cosy than spacious. Much of the seating towards the front is on high stools, though normal chairs and tables, large and small, are plentiful towards the back. (A word of warning: at certain times, the space at the very back is reserved for diners.) The floor is varnished wood, the walls are plain and dark, and the front windows are leaded with stained-glass borders. There's some outdoor seating on the pavement at the front. Kake and friends visited on a Saturday afternoon in November 2015. The place was quite full when we arrived around 1pm; there were free seats but no free tables. The back room was reserved for diners only, and was also quite full. Music was playing very quietly, only just audible above the several lively conversations going on. Five of the six handpumps were on to start with, offering Sharps Doom Bar, Autumn Red, Yule Star (£2/half), UBU Purity, and Bombardier Burning Gold. Sunny Republic Red Bus came on later. A pint of lime and soda was 55p. Food is served all day from a chain-wide menu. Venison and port pie (£13 including mash, green veg, gravy, and parsley liquor) photo was a true pie, with pastry all the way around, and generously filled. Chips (£2.75) were a fairly small portion, but hot and crisp and just about the epitome of pub chips. Although we'd booked our table in advance, they'd double-booked it for later in the day due to wanting to give the whole of the back room to a Christmas party. However, they found us another table to move to which was actually better than the one we had. Kake's verdict: Great for a booked event — it has reasonably-priced food and drink, good step-free access, and isn't as noisy or busy as one might expect for a pub so close to a zone 1 station and major rail terminus. The staff have also been very helpful with the two bookings I've made. I'd be wary of turning up on spec just for a drink and expecting to get a usable seat, though, as most of the normal-height seating is in the section that gets reserved for diners. Child-friendliness: They have at least two highchairs, the type with no trays and very little back support. Accessibility: Step-free to get in, to get to the bar and seating, and to the RADAR-locked accessible toilet. 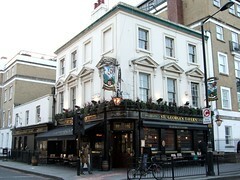 However, the front part of the pub is often quite crowded with people. Last visited by Kake et al., November 2015. Opening hours taken from the Nicholson's website, December 2015. Last edited 2015-12-24 14:59:08 (version 2; diff). List all versions. Page last edited 2015-12-24 14:59:08 (version 2).